Orlando has to be one of the most popular tourist destinations in the country. It has glorious weather all year long so if you like being outdoors, this is the place for you. 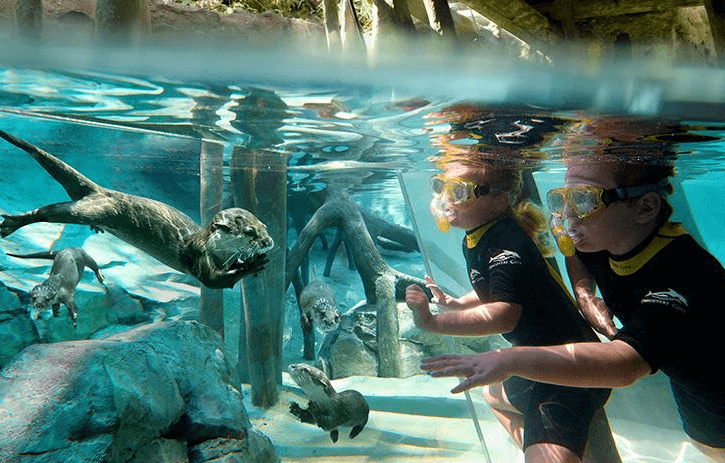 And, besides the obvious theme parks, Orlando offers plenty of activities for people of all ages. There are state parks to swim, canoe and camp, there are multiple museums that house fine art collections, and there are some high-end shopping boutiques for those who get a thrill out of spending too much on vacation. And for those looking for a completely unique and unforgettable experience, there’s Discovery Cove Orlando where you can go swim with the dolphins in Orlando. 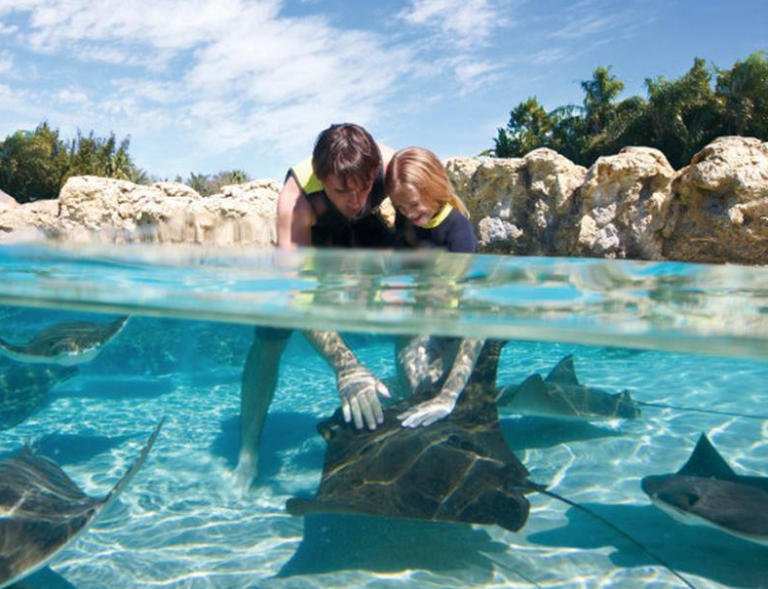 There is so much to do at Discovery Cove, you may find you have to spend a couple of days here just to experience everything! 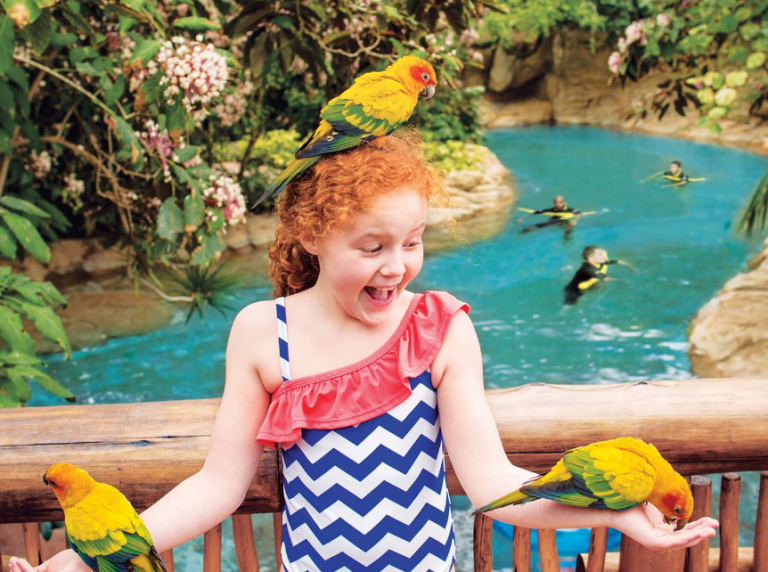 You can start your adventure at Explorer’s Aviary where you will suddenly be immersed in the most colorful and musical landscape. You’ll be delighted and amazed at the hundreds of colorful birds that soar above your head and then land on your arm to feed right from your hand! 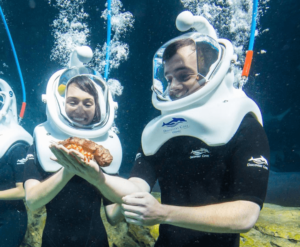 There’s also SeaVenture, a completely cool and unique experience where you can take an underwater walking tour wearing a dive helmet. The great thing is you don’t need to be SCUBA certified or have any SCUBA experience to enjoy this adventure. You’ll come face-to-face with sharks, but don’t worry, they’re on the other side of a thick piece of glass. You’ll also get to spend time with vibrant schools of fish and other unique animals like velvet rays. Some visitors have compared this experience to walking on the moon. 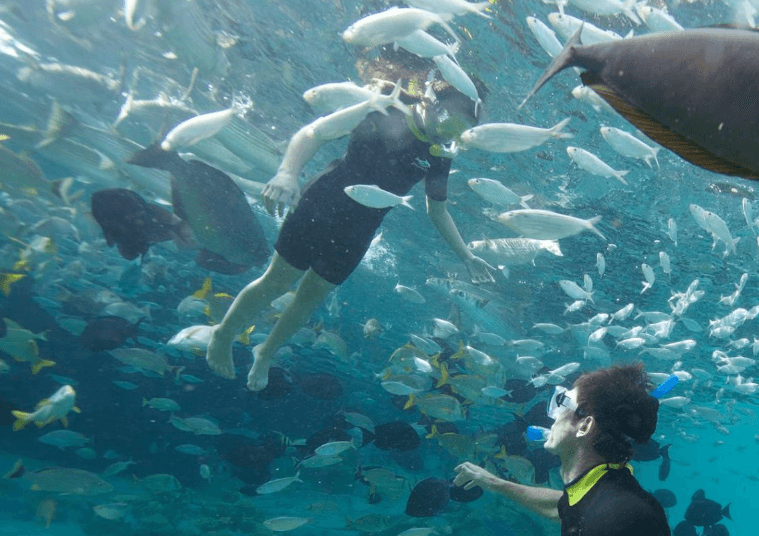 Imagine being gently swept down a lazy river, only instead of being in a boat you’re on your stomach with snorkel gear so you can see all of the beautiful and colorful wonders below you in the crystal clear waters. 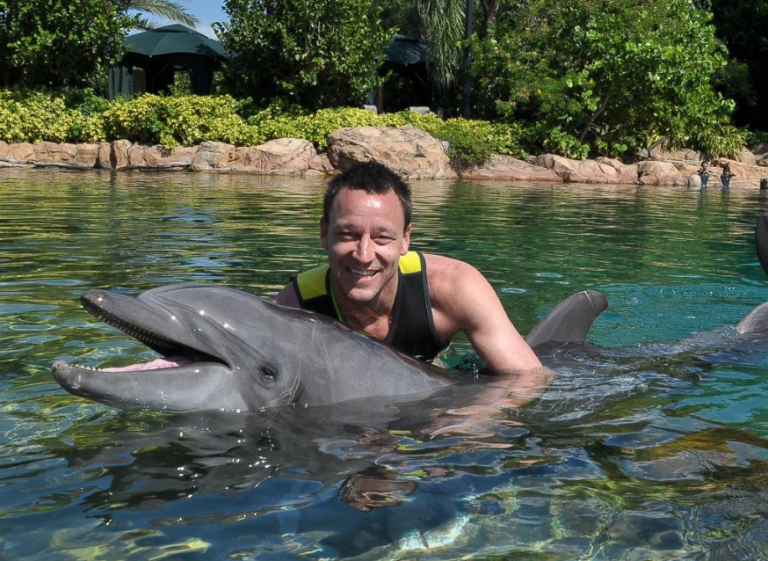 Have You Always Wanted to Swim with Dolphins? 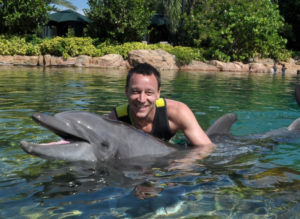 They don’t call it Dolphin Cove for nothing. 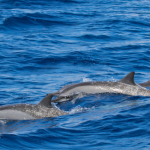 If you’ve always wondered what it would be like to swim with these magical creatures, you’ll finally get your chance. This one-on-one dolphin encounter starts with a trainer teaching you all about dolphin behavior. 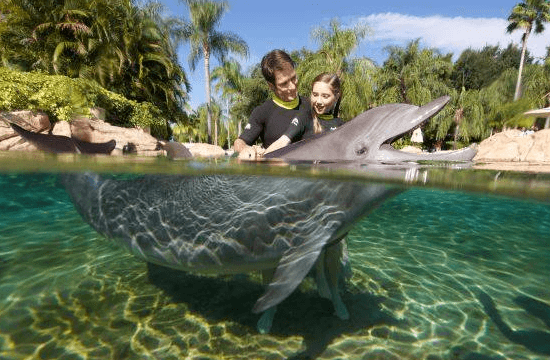 You’ll then wade into the dolphin lagoon where you’ll meet and quickly become best friends with an inquisitive and playful bottlenose dolphin. 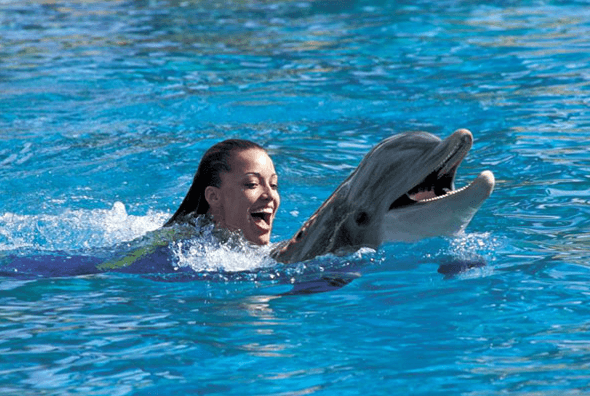 Your 30-minute interactive adventure will have you hugging and kissing your dolphin pal, and getting the ride of a lifetime when you hold on to their dorsal fin and they pull you around the water. 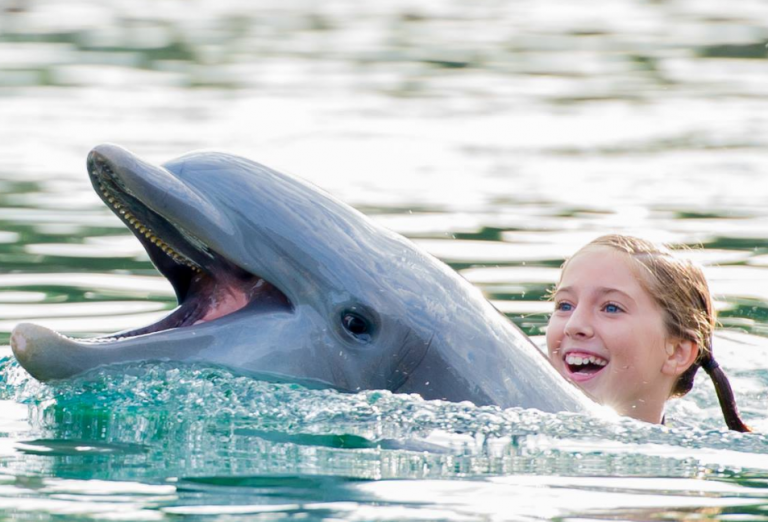 IT’s an experience you’ll never forget of swimming with the dolphins in Orlando! 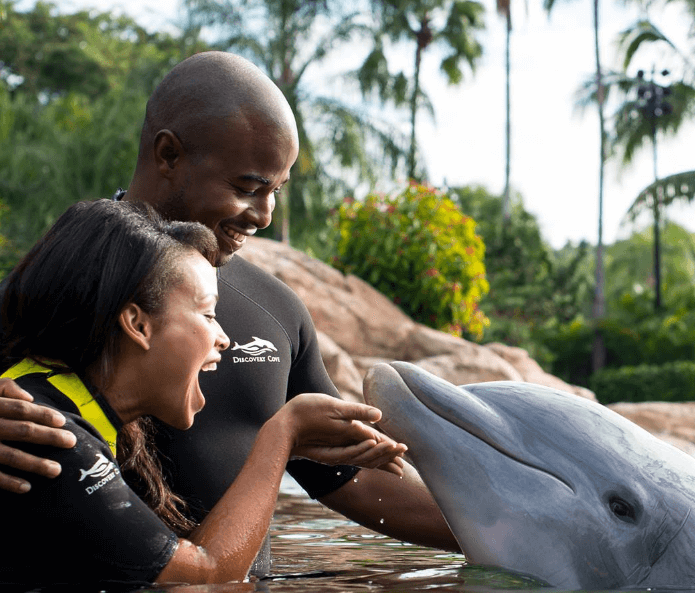 After your dolphin adventure, you and your family might want to head over to The Grand Reef to get up close to some more wondrous creatures from the sea, or visit the Freshwater Oasis and have some fun with the adorable otters and playful marmosets. You might want to relax and take a nap on the lovely man made beaches. Everyone will get their own lounge chair, towels and sun screen, so no need to worry about space for you and your family. 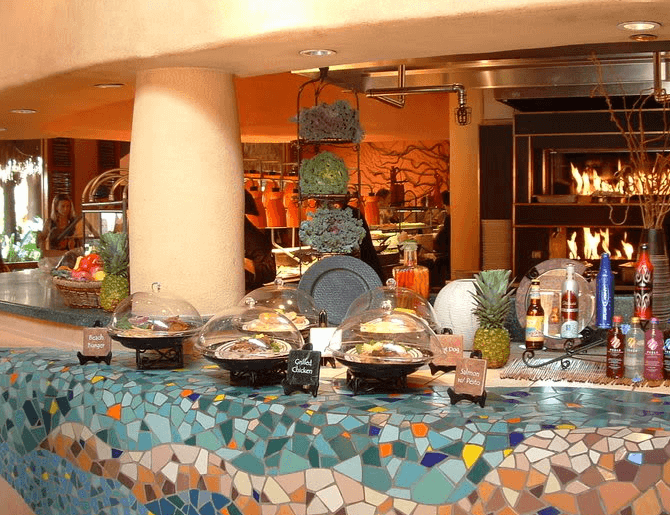 Don’t forget the delicious food that you will be getting, breakfast and lunch buffet and all your snacks and beverages all day long. 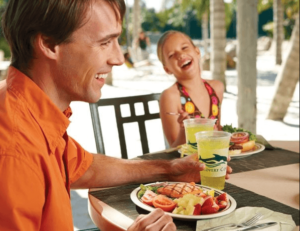 You won’t walk away hungry because you will be treated like a family guest at Discovery Cove. You will be burning a lot of calories with all the fun activities you will have to explore with in the park. And, if you still have time – and energy – you’ll be able to head to another one of Orlando’s great parks. 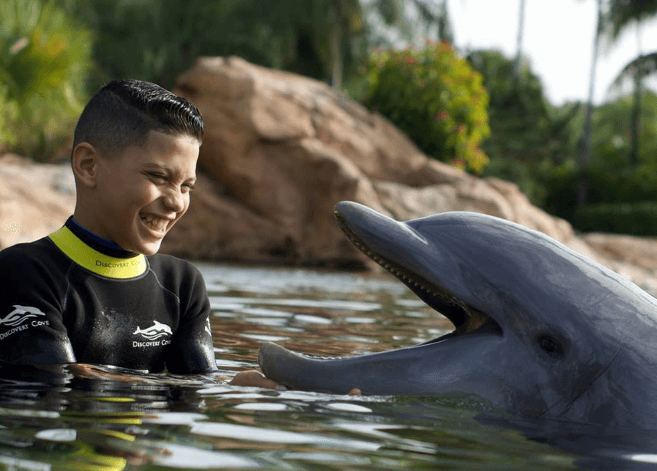 That’s right, a day at Discovery Cove includes admission to two other great Orlando parks, 14 Days unlimited admission to SeaWorld and Aquatica. If you still have a hankerin’ to interact with amazing sea animals, then head to famous SeaWorld where you can hang with playful penguins, mysterious sharks and even the gentle beluga whales. Plus, there’s thrilling rides and of course Shamu! 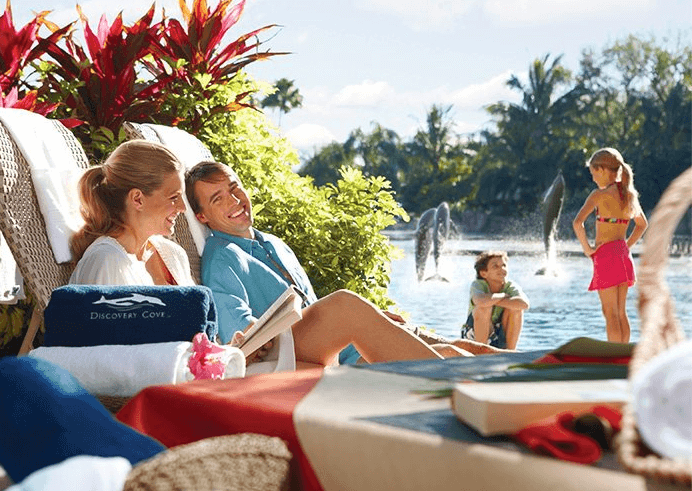 One of the coolest and most unique waterparks in the country, Aquatica could have only been created by SeaWorld. You’ll be amazed when you float through a colorful and magical underwater world of exotic fish and coral. Experience the thrill of rolling rapids, or just relax on the soft, white sand beaches while your kids still run around burning up the energy you once remember having. After you’ve rested and have gotten your second wind, you’ll want to take a tube slide through an underwater world where black-and-white Commerson’s Dolphins play and race alongside you. 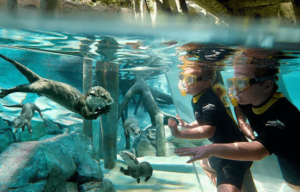 It’s no wonder people consider Orlando a magical place – there’s just so much to see and do. 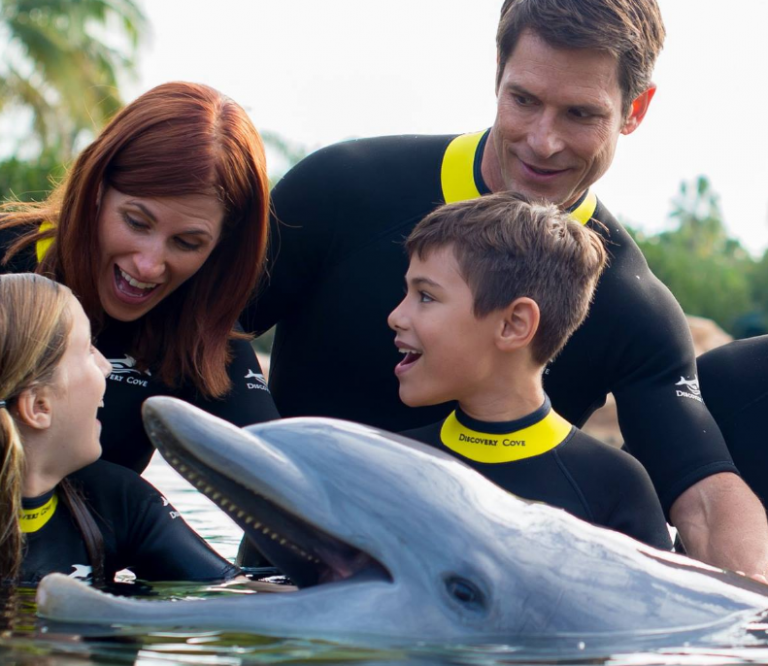 If you want to SEE amazing animals and Dot the kinds of things that will give you bragging rights back home – head to Dolphin Cove Orlando for your next vacation.